In life, the only thing that one can be sure of is change, and this we all must do with time. Riteish Deshmukh, who is surely on a high after his success with the film Housefull, has gone in for a new look, in terms of his usually unruly mane. 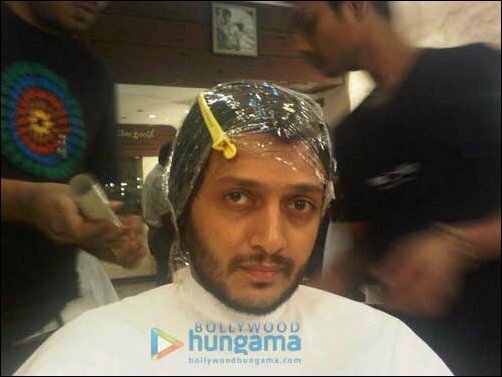 The actor was at Aalim’s salon for a new hair style sitting with his mane under wraps, Riteish looks the quintessential customer in for a trim, “salon-my head hs been wrapped like a vegetable in a mart-Don’t ask me wht he plans 2 do-I ve no clu “, tweets the actor. 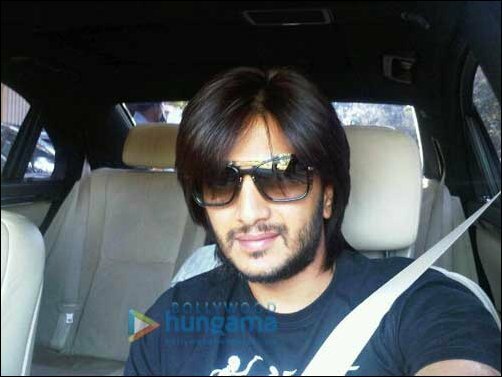 What do you think about Riteish’s new hairstyle? Post your comments below. Print article This entry was posted by Fenil Seta on May 14, 2010 at 3:35 PM, and is filed under Bollywood News. Follow any responses to this post through RSS 2.0. You can leave a response or trackback from your own site. woow,Well you look good in this photo but my true coments will be when I see you up front(Whig is not possibla). I like you more in short hair in Raan. But ….yaaa……not bad actualy…..uuuuuuun let me see the photo onemore time…..YA….doesn’t look Bad…go with this HS. woow,Well you look good in this photo but my true coments will be ,when I see you up front(Which is not possible). But ….yaaa……not bad actualy…..uuuuuuun let me see the photo onemore time…..YA….doesn’t look Bad…go for his HS. Looking great in dis style ha, even u looks great in every style coz u r a nice guy 4rm heart. LUV U……………. well ……actualy i m gr8 fan of ritiesh hairstyle but i like most in …do not disturb ….plz name the cut u have done in do not disturb bcoz i want that hairstyle on me . Kangna plays peacemaker between makers of Knockout?